"At the same time it will be solved at some point because of the effort that we are putting in. We are hoping we don't drop catches in this game," he said. 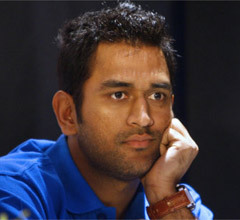 Dhoni, however, prasied fast bowlers Zaheer Khan and Ashish Nehra for their tight bowling in the death overs. 27 runs. It was a very good effort." "Ashish (Nehra) bowled five overs in a row. There was a bit of reverse swing going which actually helped us a bit," he said. The wicket at the VCA Stadium is also expected to be run-friendly.